Last updated on: 20 May 2013. Nasser bin Ghanim Al-Khelaifi (Arabic: ناصر بن غانم الخليفي‎; born 12 November 1973) is a Qatari businessman and is the chairman of beIN Media Group, chairman of Qatar Sports Investments, president of Paris Saint-Germain (PSG), and Qatar Tennis Federation (QTF) and vice president of the Asian Tennis Federation for West Asia (ATF). Al-Khelaïfi is president and chief executive officer of Paris Saint-Germain in France. He is also a member of the organizing committee for the FIFA Club World Cup. In 2019 he was elected by the European Club Association as delegate at the UEFA executive committee. In 2015, he was crowned 'favourite Ligue 1 president' and in 2016, L'Equipe named him 'the most powerful man in French football'. On 31 December 2013, Al Jazeera Sport global operations were spun off from Al Jazeera Media Network and rebranded as beIN Sports. In parallel, BeIN Media Group was incorporated and became the official owner of beIN Sports. Nasser Al-Khelaïfi was then appointed chairman and chief executive officer of beIN Media Group. beIN Sports has 22 channels including 17 HD channels and broadcasts across the Middle East, North Africa, Europe, North America, Australia and Asia. The strategy, aside from building the beIN premium sports network, is to develop the group's ambitions in sports and entertainment in production, distribution and digital media sectors. Nasser Al-Khelaifi has been chairman of Qatar Sports Investments (QSi) since June 2011. QSi is a fund dedicated to investments in the sport and leisure industry on a national and international level. Following the QSi acquisition of Paris Saint-Germain (PSG) Football Club in June 2011, Nasser Al-Khelaifi became the chairman of the board of PSG and also CEO of the club, reinforcing Qatari interest in French football. QSi has several other high profile partnerships. They also used to sponsor Spanish football club Barcelona. QSi also owns the Burrda sportswear brand. 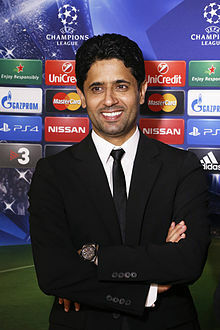 Nasser Al-Khelaifi became the new president and chief executive officer of Paris Saint-Germain in 7 October 2011. Shortly after being named president he presented a five-year plan to take Paris Saint-German to the top of the tree in France and abroad. As part of the long term plan for the club, Al-Khelaïfi brought in legendary footballer Leonardo as the new director of football. Although Al-Khelaifi had initially demanded a major trophy haul for the 2011-12 season, PSG were soon eliminated from the UEFA Europa League and both domestic cups, leaving the team only able to compete $130 million on players, PSG failed to dominate, and lost out to eventual winners Montpellier, though they did qualify for the UEFA Champions League by finishing second. In the 2012-13 season, PSG won the Ligue 1 title and also made it to the quarterfinals of the UEFA Champions League, thanks partly to the goalscoring of newly signed striker, Zlatan Ibrahimović. They eventually lost in a two-legged tie to Barcelona on away goals. In the 2013–14 season PSG again finished top of Ligue 1 with a record total of 89 points. They reached the quarterfinals of the UEFA Champions League where they lost to Chelsea 3-3 on aggregate, again going out only on the away goals rule. Again they reached the 2018-19 UEFA champions league knock phase where they lost to Manchester United at home after leading with 2 goals at Old Trafford on the first leg. PSG lost at home 1-3 (3-3 on aggregate) and were knocked out by the away goal rule. Manchester United had a makeshift team due to injuries to most players at first 11 and they had several players from the academy. PSG still lost. In June 2012, QSi acquired the Paris Handball Club and merged it with the PSG sport franchise to create a wider and more competitive sport offer to the city of Paris. Since 2012, Paris Saint-Germain Handball has won the LNH Division 1 five times, while reaching the EHF Champions League final in 2016–17 and the semifinals in 2015–16 and 2017–18. As a tennis professional, Al-Khelaïfi was the second most successful member of the Qatar Davis Cup team after Sultan Khalfan, playing 43 ties between 1992 and 2002 and compiling a 12–31 record in singles, 12–16 in doubles. Al-Khelaïfi appeared twice on the Association of Tennis Professionals (ATP) main tour, losing each time in his first round matches in St. Pölten in 1996 (where he lost to former French Open Champion Thomas Muster) and in Doha in 2001. He reached a career-high singles ranking of No. 995 in late 2002. He also won the GCC Team Tournament. Nasser Al-Khelaïfi has been president of the Qatar Tennis Federation since November 2008. In 2011, he was elected vice-president of the Asian Tennis Federation for West Asia. In November 2013, Nasser Al-Khelaïfi was made Minister without Portfolio in the Qatari government by the emir of Qatar, Sheikh Tamim. Al-Khelaïfi was born in Doha november 12th 1973, and graduated from Qatar University. He is close to the Emir, Sheikh Tamim, head of sovereign wealth fund Qatar Investment Authority. In February 2012, he won a French 'Sport Business' award, receiving the most votes out of 1,500 and finishing ahead of nine people. His growing influence in the sport was recognised in 2015 when he was crowned 'favourite Ligue 1 president in a poll conducted by France Football, with 35% of the votes cast. In 2016, the French daily sport newspaper L'Équipe named him the 'most powerful man in French football' in a 30-man list, ahead of such notable individuals as Didier Deschamps and Zinedine Zidane. ^ a b beIN SPORTS France (27 May 2014). "Mr. Yousef Al-Obaidly Appointed President of beIN SPORTS France". prnewswire.com. ^ a b "Who we are". qsi.com.qa. ^ "FIFA.com - Organising Committee for the FIFA Club World Cup". FIFA.com. ^ "Al-Khelaïfi : "J'ai beaucoup appris au contact des autres présidents de L1"". France Football (in French). Retrieved 23 February 2016. ^ "Qatari group takes control of Paris Saint-Germain". ^ "Presidents - club_presidents - PSG.fr". psg.fr. ^ "Jean-Claude Blanc Directeur Général Délégué". 7 October 2011. ^ "PSG: 'We want the new Messi'". Ligue 1. 1 July 2011. Retrieved 1 July 2011. ^ "PS aiming to bounce back after French Club failure". ^ "Les records du PSG cette saison". leparisien.fr. 19 May 2014. ^ "Après le PSG, Qatar Sport Investments devient propriétaire du Paris Handball". 20minutes.fr. ^ "Qatar Tennis Federation - QTF - Qatar Tennis Tournaments and Championships". qatartennis.org. ^ "Nasser Al-Khelaïfi nommé ministre au Qatar" (in French). www.football365.fr. 2 December 2013. Retrieved 28 June 2015. ^ "Nasser Al Khelaifi | Le top 30 du foot français - L'ÉQUIPE.FR". lequipe.fr (in French). Retrieved 23 February 2016.